This month's Degustabox was packed FULL of goodies! Many of the items are great for packing in your school lunchbox, so perfect for the back-to-school theme of the month. Other components are useful in making meals quicker. Things do tend to get busy between school, work, sports, etc. When I attempted to take a picture of the whole Degustabox, I couldn't seem to get all of the items in the shot in a reasonable manner for you to see them. So, I had to take multiple shots. So many interesting foodie items to check out! 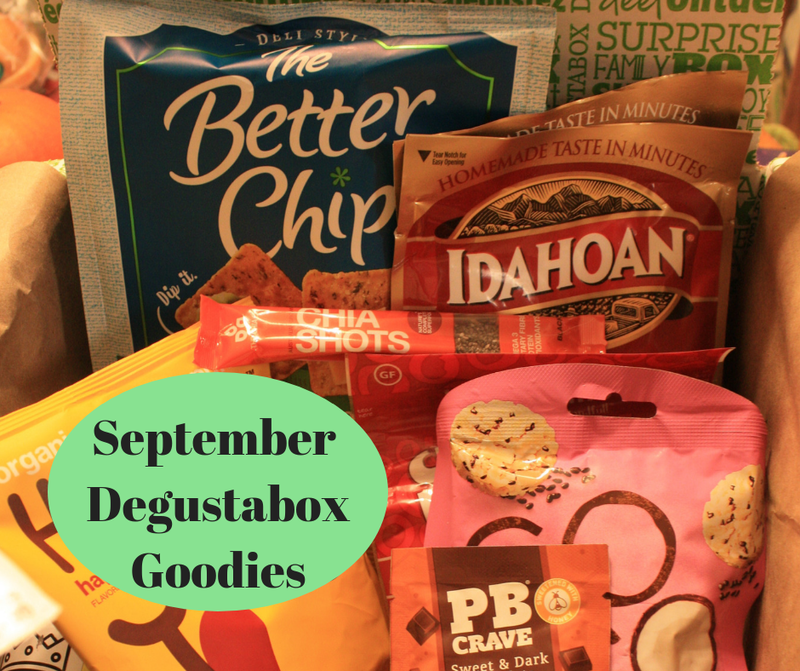 September's Foodie Goodies from Degustabox! See, I told you we received A LOT to try out throughout the month. I was snacky right away, so the first item that I tried was the Handfulls Crrrunch Bites. The Handfulls Crrrunch Bites came in BBQ Almond. The treats consisted of whole roasted California almonds wrapped in rice paper with a BBQ flavor. They sure are crunchy and addictive! I am glad they came with a resealable bag -- so I can reseal them for later. Ok, that was hard to do because they are addictive! At lunch today, I sampled some Tigertail Mustard as a nice condiment for my turkey sandwich. Tigertail Mustard is a German style mustard. I did not find it very spicy, just a tiny kick. The tube is interesting and makes the mustard easily transportable. I am pretty snacky at times, so I was pretty happy to see The Better Chip in my Degustabox. The chips are made from masa blended with veggies and spices. The jalapeno and cilantro had a nice kick and are fun for guacamole or just plain avocado. Nice crackers with a little pep! We love our monthly food exploration. It takes us the full month and sometimes slightly longer to try everything. Such an adventure and really fun in the winter when things can be quite boring and gray! Want to Try a Degustabox? Degustaboxes cost $19.99 per month and there is no shipping. Woo hoo! My readers have a special coupon code to receive their first box for $9.99 with code 69ODU. Boxes are valued at $30 so this is an awesome deal if you want to try it out! These types of things are especially fun for the kids, so may be a nice little gift! For a limited time, enter my giveaway below! 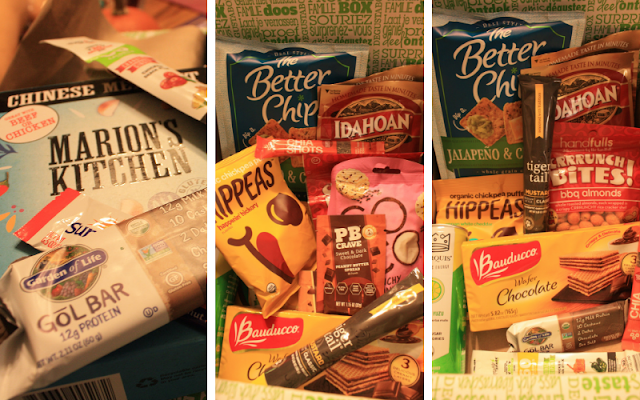 Degustabox has generously offered me one giveaway opportunity for a lucky reader. The giveaway is a short one and will end on September 20. To enter, you must reside in the USA and be 18-years-old or older. A Little Time and a Keyboard is not responsible for mailing out the box; it will be sent by Degustabox. To enter, please enter to receive email updates from A Little Time and a Keyboard or comment about what item from this month's Degustabox you would like to try. If you do both, you will receive two entries. Winner will be chosen at random. I would like to try the GoGo Crunchy Coconut Bites! The Tigertail mustard sounds perfect! We are big mustard lovers in our household! I would like to try the PB Crave Flavored Peanut Butter. The The Handfulls Crrrunch Bites sound really good! !